Princessly Polished: Seven Summer Shades Giveaway Winner, + More to Come! 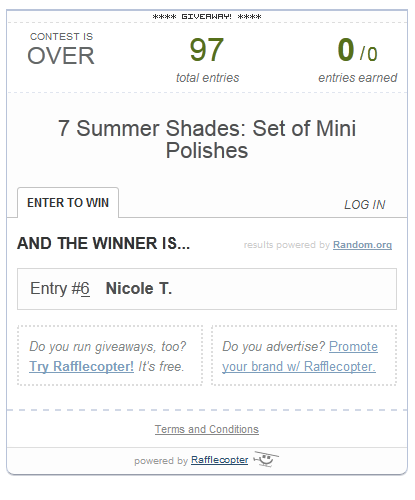 Seven Summer Shades Giveaway Winner, + More to Come! I do have to apologize, though. I got my wires crossed about the close of Google Reader also meaning the end of GFC (Google Friend Connect). I don't feel too stupid, though, because a lot of bloggers got this impression. And it did close, partly. Now it only works with Blogger blogs. Honestly, I wouldn't be surprised if Google eventually forces everyone to switch to Google+ and gets rid of GFC entirely, or perhaps replaces GFC with something else. Who knows. So, I still suggest giving my post about other methods to follow my blog a look. And I'd love to know if you're using something I haven't covered! Now, more exciting stuff! Two years ago right around this time I began blogging. A lot has changed within this time and really it has all been for the better. To celebrate these fun two years I have some awesome giveaways coming up this month. Stay tuned for more!